Click here to view the latest update on our Compassion Campaign. 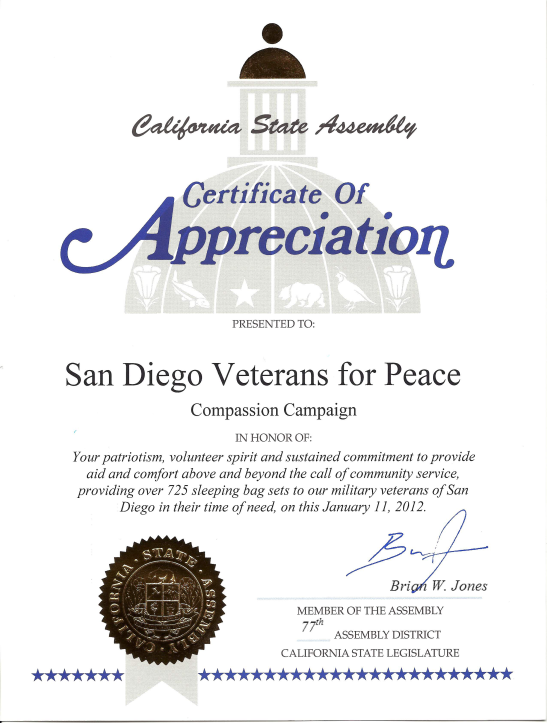 The San Diego Veterans For Peace Compassion Campaign, an outreach effort to give a sleeping bag set to each of the 9000+ homeless in San Diego, began in December 2010 and continues indefinitely. The outreach effort began after active veterans in the San Diego Veterans For Peace chapter became alarmed at the life-threatening living conditions homeless veterans and others endure on the streets and under the interstate overpasses in downtown San Diego. 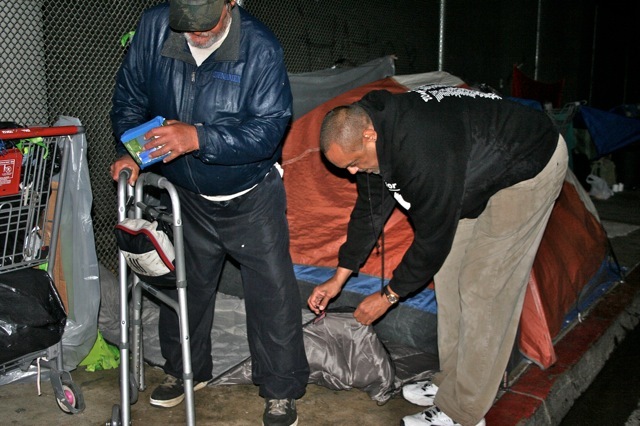 Once learning from homeless veterans on the street that every homeless person in San Diego needed a sleeping bag, a waterproof poncho, and a waterproof stuff sack, the San Diego chapter began seeking donations and purchasing and delivering sleeping bags sets to the homeless. Bag sets are always hand delivered, with each person receiving a set being evaluated for true need. Chapter veterans go out in 2 or 3 car caravans late at night and also hand out used clothing, water, and food that is donated by members, friends, and generous people in the community. The cost to the chapter of sleeping bags sets, originally $35 wholesale, was lowered to $27 per set in mid-2011 after chapter members were able to buy all products directly from the Coleman Company in Colorado, instead of locally from several vendors in San Diego and Los Angeles. As of January 1st, 2012, over 1000 sleeping bag sets had been individually delivered to homeless veterans and non-veterans alike, as public donations topped $25,000. Update 1: As of January 2014, over 2,000 sleeping bag sets have been passed out to our homeless! Update 2: As of December 2015, over 2,500 sleeping bag sets have been passed out! Update 3: As of June 2017, over 3,000 sleeping bag sets have been distributed! Update 4: As of May 2018, over 3,400 sleeping bag sets have been distributed! The Compassion campaign has been featured on local KUSI, FOX5, and KPBS television station reports as well as radio spots and print media articles in and around San Diego. Additionally, the campaign was featured on the Huffington Post website and many other on-line websites and newspapers. Chapter veterans of all five services and supporting associate members continue to provide this extremely important outreach to the homeless population each week, and hope to expand the scope of the effort as donations allow.